Mark Lawson talks to novelists who have taken on another writer's characters, including P D James, who wrote a Pride and Prejudice sequel, Anthony Horowitz, creator of a new Sherlock Holmes story, Jeffery Deaver, author of the latest James Bond book, and Frank Cottrell Boyce, who took on another of Ian Fleming's creations - Chitty Chitty Bang Bang. And what happens to a novel left unfinished when a writer dies? Incomplete manuscripts left by British novelist Beryl Bainbridge and American writer Michael Crichton were posthumously brought to publication this year, with the help of editor Brendan King and scientific journalist Richard Preston respectively. They discuss how they approached this poignant task, and A N Wilson, writer and friend of Beryl Bainbridge, reflects on the process. Producer Katie Langton. John Wilson talks to singers Tony Bennett, Johnny Mathis, Jack Jones and Bruce Forsyth, whose careers began before rock and roll, and whose combined performing experience totals over 200 years. They reflect on the art of 'intimate singing', their inspirations, and the art of sustaining a career in a business which has changed radically over seven decades. Producer Jerome Weatherald. Kirsty Lang examines how writers from India and Pakistan are tackling social and political shifts, with Booker-winner Aravind Adiga, Aatish Taseer, Mohammed Hanif and Moni Mohsin. All have published fiction in the past year with a focus on complex current issues in their respective countries, including terrorism in Pakistan and the huge social changes brought about by India's economic boom. They also reflect on the differences between readers in the Indian subcontinent and those who live outside it, and discuss how - as Aravind Adiga reveals - a warm critical reception in the UK is no guarantee of critical praise at home. Producer Rebecca Nicholson. Mark Lawson talks to three tenors and a counter-tenor: Joseph Calleja (pictured), Ian Bostridge, Mark Padmore and Iestyn Davies reflect on repertoire, singing teachers and the perils of phlegm. Producer Georgia Mann. 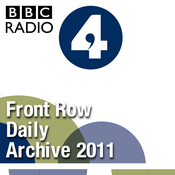 Mark Lawson unwraps a further selection of new interviews with arts headline makers of 2011. Stage and screen actor Dominic West discusses playing serial murderer Fred West, Shakespeare's Iago, and upper-class anchorman Hector Madden in The Hour. Tracey Emin, newly-appointed Professor of Drawing at the Royal Academy, reflects on opening the new Turner Contemporary gallery in her home town of Margate, her solo show at the Hayward Gallery, London, and her art-work for 10 Downing Street. Director Tom Hooper considers the success of his Oscar-winning film The King's Speech, and how almost a year after its release it is still winning awards. Another British film The Inbetweeners, based on the TV comedy, has taken more than £45 million at the UK box office and is the biggest-selling DVD this Christmas. Writers Iain Morris and Damon Beesley reveal how far they are prepared to push the cast. And Mark meets Mary Berry and Paul Hollywood, judges on The Great British Bake Off, one of the year's unexpected TV hits. They discuss their approach to cake-tasting, and the art of judging the perfect bake. Producer Lisa Davis.